NOJA Power has recently acquired a new facility located at 16 Archimedes Place, Murarrie to house its corporate office and factory. Powerco, New Zealand, has commissioned its Pohangina Apiti automatic backfeed restoration scheme, utilising the NOJA Power OSM15 recloser units already deployed throughout their network. Powerco previously relied on a SCADA system for manually determining the direction of a fault, but moving to an automated back feed restoration system will significantly reduce SAIDI minutes in the Powerco network. Powerco is the second largest energy distributor in New Zealand, supplying over 312,000 connections in the North Island urban centres of Palmerston North, New Plymouth, Wanganui, and Masterton, as well as the surrounding rural areas. 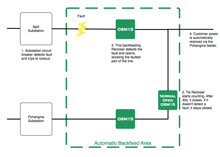 Automated backfeed restoration is the process whereby two feeders are tied by a ‘normally open’ recloser. This recloser monitors voltage using voltage sensors on either side to detect if power is lost on one of the feeders, and if voltage is lost for a certain interval, the tie unit will close, restoring power by backfeeding from the non-faulted feeder. In order to safely take advantage of automated backfeed restoration, a power utility must conduct a study to determine the correct amount of torque angle to apply during a fault condition, in order to correctly detect the direction of the fault, and thereby apply the correct protection settings. Powerco took advantage of the OSM’s capabilities to calculate polarising voltage, operating angle, and current to accurately determine fault direction. “Essentially, the OSM reclosers used in this scheme are the same device that has been used elsewhere in the Powerco network. However, additional logic has been enabled that can detect a directional fault or sense a loss of voltage about each of the device’s high voltage terminals,” states the Powerco report on the study. The OSM15 were ideal for this scheme since they already include the directional and automatic backfeed restoration features in the standard unit, and NOJA Power was able to provide detailed service and support for implementing these features. The Pohangina and Apiti feeders were selected because their conductors had adequate capacity to support backfeed restoration, and because the very long (180 km) Pohangina feeder would stress test the limiting factor of voltage support. The study concluded that backfeed current would be satisfactory even during periods of very high load, allowing a safe forward current of 120A and a backfeed current of 90A along either feeder. Since Powerco already uses OSM15 reclosers on their network, the success of this study could open the way to automated back feed, where network configuration, capacities, and devices allow.